One would think a name like Servetus Bispham would be rare, or at least it would be easy to spot in the various vital and historical records …… not necessarily so! In the absence of the Army service records that accompany a Chelsea Pension (Bispham did not go to pension), other sources were tapped with a spectacular lack of success. What was the origin of the surname Bispham? This might have helped in the discovery of Servetus Bisphams origins. First port of call was my tattered copy of P H Reaney’s Dictionary of British Surnames – no entry. The next tactic was to look at Great Britain Family Names Profiling website, an online resource that examines surnames collated from 1881 and 1998 records. I discovered from this that the name Bispham in 1881 had a frequency of seven in one million and in 1998 six in one million – not necessarily the name getting rarer, but the population getting larger. It was categorised as a locational name; settlement ending with ‘ham’. 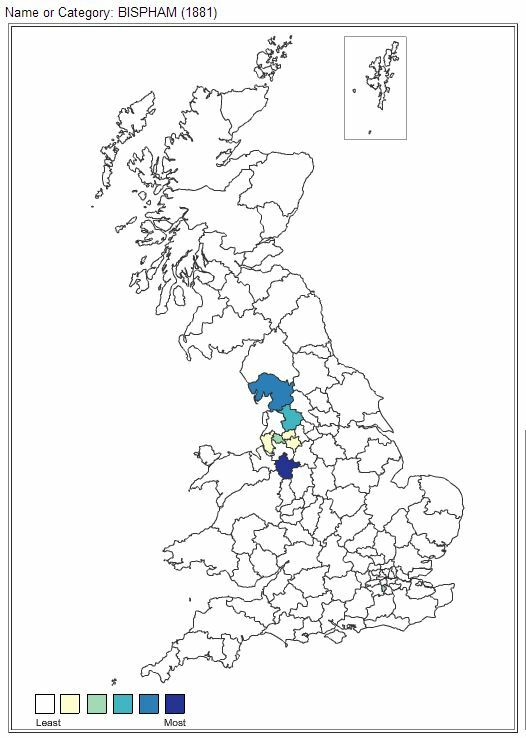 Note the distribution of the surname mapped in England, Wales and Scotland (click on the image to enlarge). Although county boundaries have changed, this shows the densities of the surname (1881) in Staffordshire, Cheshire and Lancashire. I looked for the surname on the 1841-1881 Census of England and Wales, realising of course that Servetus Bispham left England prior to the 1861 census. The purpose was looking at likely occurrences of the surname to try to get a fix on his most likely place of origin. 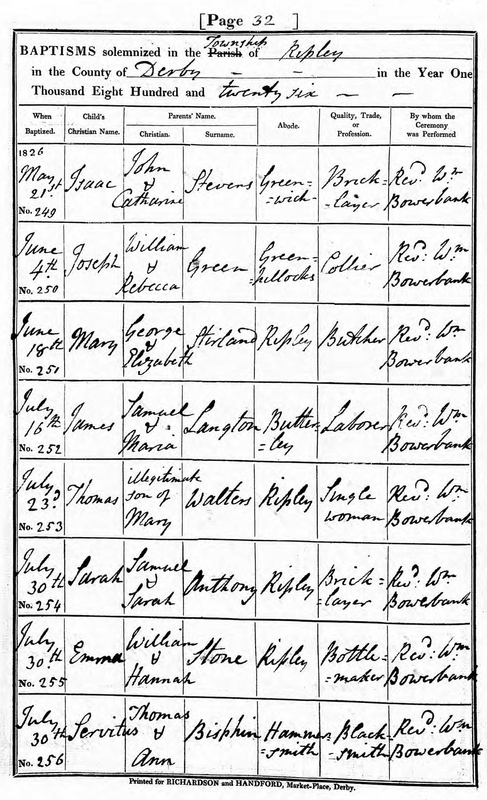 The results for the incidence of the surname are in brackets: 1841 (169); 1851 (172); 1861 (165); 1871 (232); 1881 (196). I then searched specifically for the name Servetus Bispham and got one hit – in the 1841 Census in Greenwich. The details fitted what I knew about Bispham, but nonetheless not conclusive and certainly not helpful for any other information. Despite finding Bispham under a different name (John) in the 1851 census in Butleigh, Derby, I thought the jury still out on his origins. 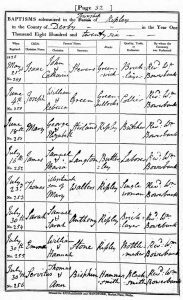 Statistics for births, deaths and marriages in England & Wales from 1 July 1837 to 31 December 1851 show a majority of surnames in Lancashire and a smattering in London in, or close to, Greenwich. My next visit to the ‘public member trees’ of ancestry.com was an act of some desperation. I discovered 26 public member trees with a varying amount of information. All agreed on the year of Bispham’s birth; many gave a precise date; his place of birth varied from unknown to Ireland, Lancashire, Derbyshire. All agreed on his date of marriage and spouse, but the number and names of their children varied. I initially used the common denominators from the most reliable of the ancestry data together with official sources. Thus finding records of Servetus Bispham prior to his arrival in Western Australia was not an easy task, until I was assisted some two years after my original research, by an distant collateral descendant, Peter Bathe (1). 1826: Born in Hammersmith, Ripley, Derbyshire (6). 1826: 26 July, baptised Ripley, Derbyshire, son of Thomas Bispham and Ann nee Fell (1). Name variously transcribed in baptism records as Servitus Bisphin/Bisphim (1A). 1841: Living at Bath Place, Garden Row, Greenwich with Harriet Cooper and her two children. Age 15. Occupation blacksmith (3). 1847: 10 October, married Esther Coppin, Bromley, Kent (4). 1849: c. December, enlisted Royal Sappers and Miners (2). 1851: Esther Coppin (not recorded as Bispham) living at 151 Regent Street, Lewisham with her mother, siblings and her daughters Emily Elizabeth and Ann. Age 27. Occupation laundress. Born Lewisham (5). 1851: Accommodated at the royal palace Kensington or the cavalry barracks Kensington with other soldiers in the Royal Sappers and Miners where his name is recorded as John Bispham and his birthplace as Butleigh [sic], Derby (6). 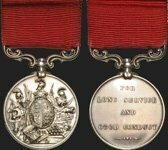 1851: Participated in the Great Exhibition at Crystal Palace for which he was awarded a medal and present. 1851: 18 December arrived Fremantle on Anna Robertson 20th Company RSM (7). 1851-1860: Probaby working as Instructing Warder at Fremantle as Musters throughout do not record assignment in any other depot. 1861: 13 February, Guildford Road Party (8). 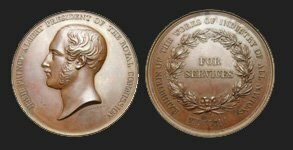 1861: 28 October to 30 November, Furlough (9). 1861: 21 December, Army Discharge (9). 1861: Grant of 20 acres of land at Albany (10). 1873: Signed Petition* for exoneration and release of Lockier Clere Burges who had been sentenced to five years penal servitude for the manslaughter of an aboriginal man (11). 1877: Wife Esther Coppin Bispham died 1877 (12). 1887: 8 October, died Chockerup, Mount Barker (13). 1887: Buried Albany Memorial Cemetery. ‘Armourer in the Royal Engineers’ (13). * Erickson:232 records ‘signed petition in Krakouer’s favour 8.1885’ but I can find no evidence of this. Emily Elizabeth, Lewisham, Q3 1848, Vol.5, p.303. Died 1852. Elizabeth Ann, Lewisham Q2 1850, Vol.5, p.315. Died 1852. Mary Ann, Fremantle 1852, Reg. 1986. Died 1938. Thomas William, Fremantle 1854, Reg. 2657. Died 1874. Esther Amelia, Fremantle 1856, Reg. 3498. Died 1857. George Henry, Fremantle 1858, Reg. 4431. Died 1923, Auckland, NZ (14). Emma, Fremantle 1861, Reg. 5899. Died 1925. Alice Amelia, Fremantle 1863, Reg. 7364. Died 1919. 1. Peter Bathe email dated 27 Sep 2017. 1A. Transcriptions of Derbyshire Baptism records, Helen Betteridge/Jean Shannon, and Family Search [GS Film No. 1752221]. 2. Return of 20th Company RSM Serving in WA Feb 1855 [WO1-437]. 3. 1841 Census England & Wales [HO107-489-7]. 4. Family Search [GS Film No. 1042455]. 5. 1851 Census England & Wales [HO107-1591]. 6. 1851 Census England & Wales [HO107-1480-906-35]. 7. Musters and Pay Lists Sep-Dec 1851 [WO11-126]. 8. Dictionary of Warders & Gaolers p.17, D J Barker. 9. Musters Rolls & Pay Lists Oct – Dec 1861 [WO11-199]. 10. Bicentennial Dictionary, Vol.1, p. 232, Rica Erickson. 11. Perth Gazette, 21 Feb 1873. 12. WA Death Index, Reg. 9530. 13. Albany Court House Death Records, Book 3. 14. John Cox email dated 27 Jan 2018.